To tackle a do-it-yourself plumbing project, you need to know how to recognize different types of pipes. Recognizing the different types of pipes within your house is vital to knowing the right repair technique. 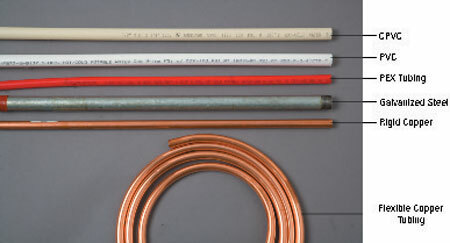 The most common pipes used today are copper, PVC, or ABS. However, when dealing with older homes, you might encounter a number of other piping material. For example, homes built before 1960 used galvanized steel or cast iron DWV (drain/waste/vent) pipe systems. Here’s a quick look at types of pipes commonly used in homes, beginning with the pipes used for DWV systems. 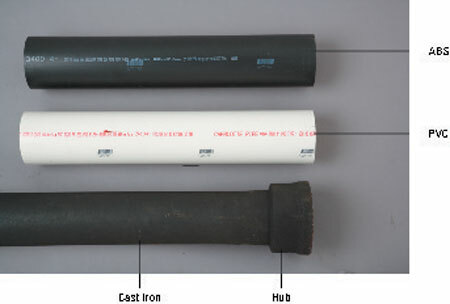 Cast iron: Commonly used before 1960 for the vertical drain, vent stacks, and sometimes the horizontal drain lines. Cast iron is durable, but can rust over time. Call a professional plumber to replace rusted sections with plastic (PVC or ABS) and the correct transition fittings. Plastic: Plastic pipe comes as either ABS (acrylonitrile-butadiene-styrene) or PVC (polyvinyl-chloride). Most homes since mid-1970 have plastic pipes and fittings because it’s inexpensive and easy to use. Simply glue the joints using a primer and liquid cement. ABS: This black pipe was the first plastic pipe to be used in residential plumbing. Today, many areas don’t allow ABS in new construction because joints can come loose. Check with your local plumbing inspector if you want to use ABS. PVC: This white or cream-colored pipe is the most commonly used pipe for drain lines. It’s strong, untouchable by chemicals, and seems to last forever! The rating and diameter is stamped right on the pipe. Schedule 40 PVC is strong enough for residential drain lines, but check with your plumbing inspector first. CPVC (chlorinated polyvinyl chloride) pipe has the strength of PVC but is heat-resistant, which makes it acceptable in many regions for use on interior supply lines. Schedule 80 PVC is sometimes used for cold-water supply lines, but it isn’t allowed in some regions because it isn’t suitable for hot water. Do-it-yourselfers can handle ABS or PVC pipes, but call a professional for cast iron. Steel: Galvanized steel pipe is common in older homes. Galvanized pipe is strong, but lasts only about 50 years. Before repairing, consider replacing instead. Call a professional to deal with it. Consider longevity and expense when choosing piping.